Indie Retro News: Alex Kidd 2 - Curse In Miracle World - SMS Demo Hack looks seriously cool! Alex Kidd 2 - Curse In Miracle World - SMS Demo Hack looks seriously cool! In 1987 Sega released the great side-scrolling platform game ' Alex Kidd ' for the Sega Master System console. Although it was first released in Japan in 1986 but internationally in 1987, it was one of the most well known games as it was also built into most Master System II's. 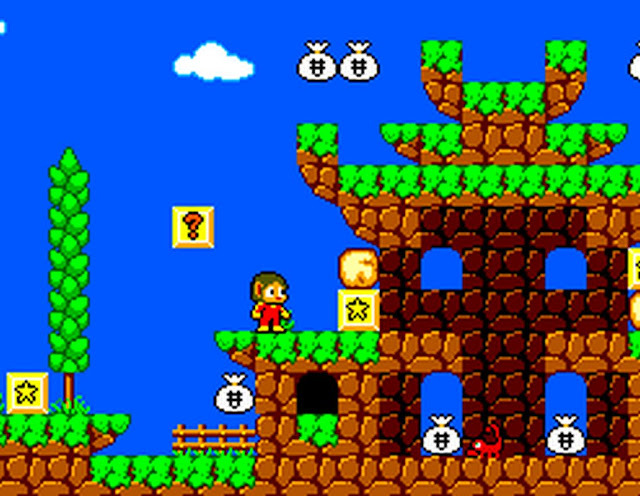 For anyone that has played that great game, will be pleased to know Yeti Bomar (aka Watain) has released the Alex Kidd 2 - Curse in the Miracle World demo, which is an eye popping Sega Master System hack of the original game made with KiddEd. If you have played the game when it was first released and loved it as much as I have, you owe it to yourself to play this 5 level demo. Not only does have great level design, but the colours and graphics are much improved beyond the original game. In all honesty I can't wait until Alex Kidd 2 - Curse in Miracle World is fully released and is available in English, as currently it's in French. A patching program such as beat or Floating IPS will be needed to add the hack/patch to the main Alex Kidd ROM, which isn't available here.